Stan Perdue is riding from his native Georgia to Arizona! Stan Perdue is leaving his home in Maysville, Georgia to ride to Sierra Vista, Arizona! "This is my first Long Ride and I'm very excited," Stan wrote in an email to The Long Riders' Guild. 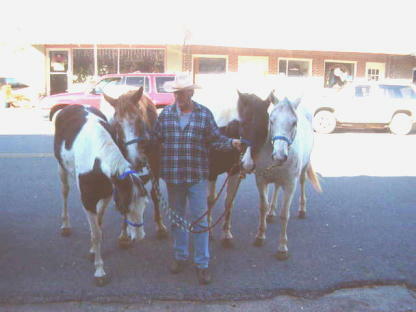 His companions are his paint horse, Banjo (above left) and Apache, an Appaloosa (above right). Stan, a retired Army Sergeant First Class, plans to take his time and go slowly. Here are three photographs, taken the day of Stan's departure. On the open road at last! Arizona: 80 90 – Victory! "Stan Perdue is doing fine! 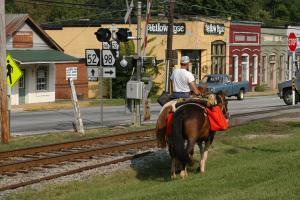 He is in Marble Hill, Georgia tonight, approximately 75 miles from his starting point. He said people along the route have been great. He has only slept under the stars a couple of nights. People have really opened their houses to him. He said he is having a ball and tonight he and the horses went for a swim in the river. Everyone also got a bath! Will keep you informed of my buddy's progress! Stan has since contacted The Long Riders' Guild himself, and told us he had ridden as far as Waleska, Georgia. He sounds immensely happy! After a long pause, Stan is back on the road again - with two new equine companions. 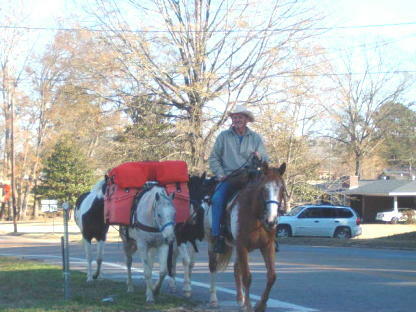 Stan is riding Apache, with Susi-Q, a little Paint-Appaloosa on loan who is "perfectly built for packing," Blue, the blue-eyed Paint and Banjo who is "carrying the groceries." The team is approaching Mississippi on Hwy. 96. We have asked Stan to send a photograph to The Guild! From Alabama Stan sent us these photographs, courtesy of the West Alabama Gazette. "Day 239, Riding Day 76, Sun, Apr 10, 20 miles, 1339 total miles, Paint Rock, TX on Farm-to-Market (FM) Road 765, 1 mile west of the intersection with US Hwy 83, will be going to Ballinger tomorrow. Well Apache got a rest today. He has a sore on his withers and I couldn't seem to stay off it today. So I stopped on the side of the road this morning and put Suzy-Q's pack saddle on Apache (got completely off his sore) and saddled up the un-trained Suzy-Q! It was a trick for a little while. She doesn't neck rein and is a little on the jumpy side! She doesn't jump at cars and such, she is jumpy just because she's being ridden. She improved steadily today and will be better tomorrow, I'm sure. Was referenced to Mr. Ed Lloyd by last night's host, Mr. Bill Lopez. Bill was right on the money. Mr. Lloyd is a 69-year-old widower and lives alone in a very nice house on 700+ acres. He has sheep, cattle and a female golden retriever named Nicki, who is Bandit's playmate out by the pool tonight! Mr. Lloyd and his friend Ms.. Iris Reed took me on a grand tour of San Angelo this evening and we had Mexican for supper at "Little Mexico" - very nice. I got to see Fort Concho, on the Concho River. Ft. Concho was built during the indian days and San Angelo was then built around it! Not to mention the tour was in a very plush Lincoln Town Car! Oh what a LIFE! The crew has a grassy arena-sized lot and are dead-pig happy! I'm in the house with all the comforts and then some! Does anyone wish you were me? Good night and stay tuned! "We are in the Sacramento mountains, which is a subdivision (if you will) of the Rockies. It is the lower end of the Rockies and GORGEOUS!!!! I have stayed with and met so many wonderful folks since I left - even I can't believe it. I never dreamed this trip would be as it has. I could never do anything or have I done anything in the past that has been as rewarding as this!! Thank you all SOOOOOOOOOOO much for making it possible and pleasurable. I will never forget this!" Stan has completed his journey! 2,200 miles ago (August 14, 2004), some would state "He's crazy" or "He'll never make it" or "We'll pick him up somewhere in Alabama", etc. Well, when we walked into Tombstone, Arizona on Friday, June 24, 2005, at 1:10PM, some must retract their statements! Carrie (Deal) Wilder flew from Atlanta to visit and support. Steven D. Whitaker, (aka Steve, aka Buggar Bear) flew from Reno to visit and support. Many Thanks, Much Love, Much Appreciation & Ultimate Respect to all of you who have ridden, emailed, written, called, donated, supported, smiled, waved, nodded and lived in my DREAM! I sincerely hope that each of you were able, in some way, to ride with me in spirit & some got to ride in person - which was wonderful!!!!!!!!!! 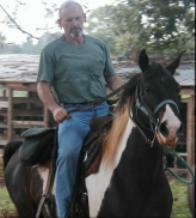 Banjo is in a new home with my Arizona brother "Ray Bouton" and will be ridden by his 15-year-old daughter "Lauren". I couldn't have placed him better - he is now a work horse and needs work. 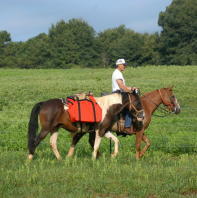 He will be running barrels in competition and trail-riding in the beautiful Southwest mountains & desert. Suzy-Q is sold to two people in one family. They will have to work this out on their own! Either home will be wonderful and she will get a variety of three or four young girls. They will work her on "fun" & "trail" rides. Some of them have ridden her and they get along GREAT - much better than she & I.
I am VERY happy and pleased with the homes I have placed my babies in! Apache will stay with me until "Death Do Us Part". 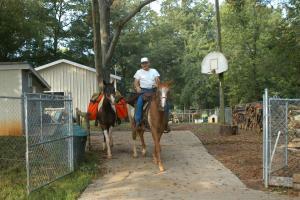 He and Suzy-Q are still in the pasture with Bill Bouton's 2 horses and seem to be enjoying life. Apache is on vacation/R&R until he is perfect again. The HORSES deserve all the credit- they did all the leg work! What a wonderful reception we received in Tombstone. We were on the front page of the Sierra Vista (Arizona) Herald, Saturday morning. We will be in the next edition of the Tombstone Tumbleweed. We will also be featured in the August issue of "Trail Blazer" magazine. We partied the weekend away in true "Cowboy" style! BIG Thanks to Ray & Lauren Bouton and Mike & Jared (aka Buggar) Trejo for riding in with me and, by the way, Buggar, you are on the front page with me! Carrie & Steve left Sunday and I moved over with the Boutons! They are some WONDERFUL folks! Today I picked up a 1995, three-quarter-ton (2500), Dodge pickup with the Cummins Turbo Diesel. I have wheels under me again, thanks to many of my WONDERFUL friends and a kind seller! Thanks to you all! Should be finding a place to call mine real soon. I'm thinking about working for a while here and then maybe taking a wagon trip to see the rest of the U.S. We'll see what happens. I'm in the "BEST" of hands with Harry & Marge Bouton - two of the GREATEST Americans that have ever lived and raised their children to be the same! The Bouton Boys (Ray & Bill) & their WONDERFUL LADIES (Barbara & Barbara) have raised their three girls (Lauren, Christine & Shephanie) to be the same! I'll be in The Gainesville, Georgia area within the next month - I'll let you know more specifics soon. I hope to see some of you! Especially you Shar Porier! Once again, Thanks to all and I'll be in telephonic-touch with everyone REAL soon. If you were worrying - STOP! If you were thinking - KEEP THINKING POSITIVE! If you were praying - KEEP PRAYING! Congratulations from all of us at The Guild, Stan!